On the top bar or the notification bar/drawer of your Android phone, you will see different information at a glance. The bar is always present unless you are using an app or playing a game in full screen. The bar contains basic information like Wi-Fi, phone network status and the clock. Another important display that is present there is the battery meter. It shows your standing battery charge/discharge. However, there is an option to change this display so that the battery percentage remaining is also displayed. You will have to just turn it on from the settings. The option is present in devices powered by Android Marshmallow—phones like Nexus 6P or Nexus 5X. When you turn on the battery percentage in Android Marshmallow, it displays the numerical value of the battery, inside the batter. So, you will know exactly how much juice you have left instead of just the visual information. Enable the System UI Tuner by long pressing the settings shortcut present in the navigation drawer. 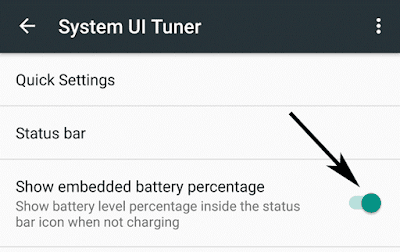 Go to Android Settings and under System access the new option that says System UI Tuner. Tap on the slider right next to the option that says Show embedded battery percentage. Now, you will see a small number in your battery that denotes the percentage of juice that is remaining. Previously, it was just the visual representation and now you have a number to go along with it. However, the size of the text is so small that you might have to look from a really close distance or enable larger text, which only seems to help you slightly. Right now, take the option as it is and let's hope that it might improve in the future.